Interfaith and human rights groups gathered in Jakarta, Indonesia, this past week to show their support for Meiliana, an Indonesian Buddhist who was sentenced to 18 months prison in August for complaining about the volume of the call to prayer in the town of Tanjung Balai, North Sumatra. The case has again brought the Muslim-majority country's controversial blasphemy laws to the fore, with religious minority groups concerned it signals further erosion of their rights amid rising Islamic conservatism. In a declaration, the groups called for the release of Meiliana, saying she was "recently imprisoned for expressing her personal opinion peacefully." The statement was signed by Amnesty International, leading bodies representing Christian, Hindu and Confucian Indonesians, and the Alliance of Independent Journalists Indonesia. In 2016, the now-44-year-old of Chinese ethnicity privately voiced to the son of an imam near her house that the call to prayer from the local mosque had become louder. FILE - Ethnic Chinese woman Meiliana weeps during her sentencing hearing at a district court in Medan, North Sumatra, Indonesia, Aug. 21, 2018. "Even if you look at the fundamental principles of the law, this is not blasphemy," said Rumadi Ahmad, a religious scholar and a senior member of Indonesia's largest Muslim organization, Nahdlatul Ulama, who was used as an expert witness in the case. "But many judges do not have a comprehensive understanding of the meaning of blasphemy." Suhadi Sendjaja, the chairman of Buddhist organi zation Niciren Syosyu Indonesia, said, "This is a ruling not from Islamic authorities, but from a law issued by the president â¦ it is not only for Chinese people, or for Christians, or Buddhists, but also for adherents of Islam." In contrast to Meiliana's sentence, however, several hardline Muslims who attacked Chinese businesses and 12 Buddhist temples in Tanjung Balai in anger over her alleged blasphemy were sentenced to a maximum of two months behind bars. Blasphemy has technically been illegal in Indonesia since 1965, when it was made a crime to criticize, be hostile to or adhere to "deviant" interpretations of one of the nation's six official religions: Islam, Christianity, Catholicism, Confucianism, Buddhism and Hinduism. Its use, however, has risen exponentially during Indonesia's democratic era â" particularly since the presidency of Susilo Bambang Yudhoyono, who was electe d in 2004. He served for 10 years. Amnesty says at least 106 people were sentenced under blasphemy charges between 2005 and 2014. Prosecutions have disproportionately targeted minorities â" particularly the Shia and Ahmadiyya communities that are considered "deviant" by the Sunni Muslim majority. In May 2017, the country saw its most high-profile conviction yet â" former Jakarta Governor Basuki "Ahok" Tjahaja Purnama. The widely popular ethnic Chinese Christian was sentenced to two years in prison after he was found to have insulted the Quran, following months of mass demonstrations by Muslim groups. For Rafiqa Qurrata A'yun, a law lecturer at the University of Indonesia, the increased use of blasphemy laws in Indonesia is representative of the politicization of religion as a tool for the nation's "predatory politics." "The Meiliana case reflects the rise of religious sentiments in the lead up to [North Sumat ra's] gubernatorial election," she told VOA via email. The U.S. Commission on International Religious Freedom's annual report for 2018 names Indonesia as one of 12 countries where violations of religious freedom are "systematic, ongoing and egregious," alongside Afghanistan, Iraq and Egypt. "Indonesia's central government at times responded in a manner that supports religious freedom and related human rights, but provincial and local governments, as well as law enforcement, regularly exacerbated divisions and failed to prevent religious-based discrimination and violence," it said of the situation during 2017. Irsyad Rafsadie, a researcher at the PUSAD Paramadina Center for the Study of Religion and Democracy, said local law enforcement across Indonesia is often reluctant to prosecute actors from the majority group for fear of further incensing communal tensions.
" ;Their rulings on perpetrators from the majority group are often not serious," said Irsyad, referring to the light sentencing of Islamic hardliners who attacked Buddhist temples in Tanjung Balai. "They proceed with prosecutions as a mere formality." 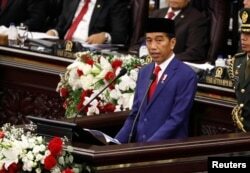 FILE - Indonesian President Joko Widodo deliver a speech in front of parliament members at the parliament building in Jakarta, Indonesia, Aug. 16, 2018. President Joko "Jokowi" Widodo said he "cannot intervene" in the case of Meiliana, but has suggested that she could appeal to Indonesia's Supreme Court. Asked about the likelihood of Indonesia' s blasphemy law being overturned, Rafiqa from the University of Indonesia said, "It would be very difficult because two judicial reviews have already been submitted and both of them failed." The conservative Constitutional Court denied a petition to repeal the law in July. "This is a warning not just for Tanjung Balai or North Sumatra, but for all of Indonesia," said Rumadi of Nahlatul Ulama regarding the Meiliana case, suggesting that issuing a moratorium on the law could be a short-term solution. "There are signs there is narrowing space for tolerance," he added. "I believe that tolerance is not enough. Tolerance still suggests distance," said Suhadi, the Buddhist leader. "We need acceptance."